Getting the client to sing a simple song such as Happy Birthday. 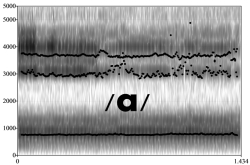 Getting the client to sustain the vowel /a/ – (not the MPT task). When assessing voice without the aid of instrumental measures this is known as perceptual assessment of voice. When conducted formally the investigator will follow a published protocol. An example of this is my own Clinical Voice Evaluation 2 (CVE2). 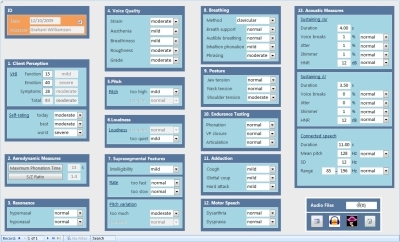 Published originally in 2003 this was a Windows® based software program designed to assist in the perceptual assessment of voice difficulties in both adults and children. Assessment protocols such as these will typically incorporate the sorts of “functional assessment tasks” you are studying. As you infer, it is necessary for the practitioner to be clear about what data can legitimately be gleaned from each task. With regard to this, here are my thoughts on the two tasks you are investigating. Getting the client to sing a simple song such as, Happy Birthday. What is the purpose and what would you be listening for? Unless this activity is audio recorded it may be too brief to give many insights into voice quality. Similarly, I don’t think this activity is suitable for endurance testing, as it is unlikely to be either long enough or sufficiently vigorous. The purpose of this task would be straightforwardly to gather data on (particularly) resonance, pitch, loudness and suprasegmental features to help build a vocal profile. It’s important to remember that this (like so much of what voice therapists do in their assessment sessions) is a performance task that is likely to invoke a reactive effect. If we are concerned with improving the speaking voice in naturalistic settings then we must treat any observations/findings from this task with caution. 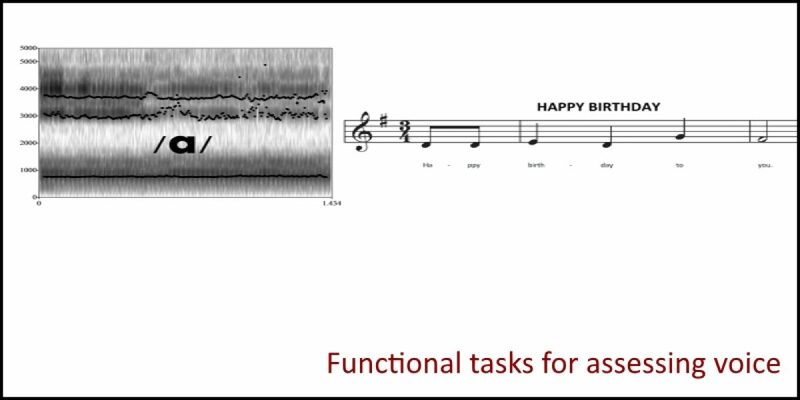 The purpose of this task would be primarily to gain some insights into voice quality (sustaining the long open vowel /a/ is one of the best methods for detecting variations in voice quality when relying solely on perceptual assessment). Again, of course, the same cautions must apply as indicated above: this is not a real-world activity and it is most certainly not spontaneous conversation.